1920 Waterman Patrician lever-filler in the gorgeous and unique Moss Agate. The pride of the Waterman pen line! 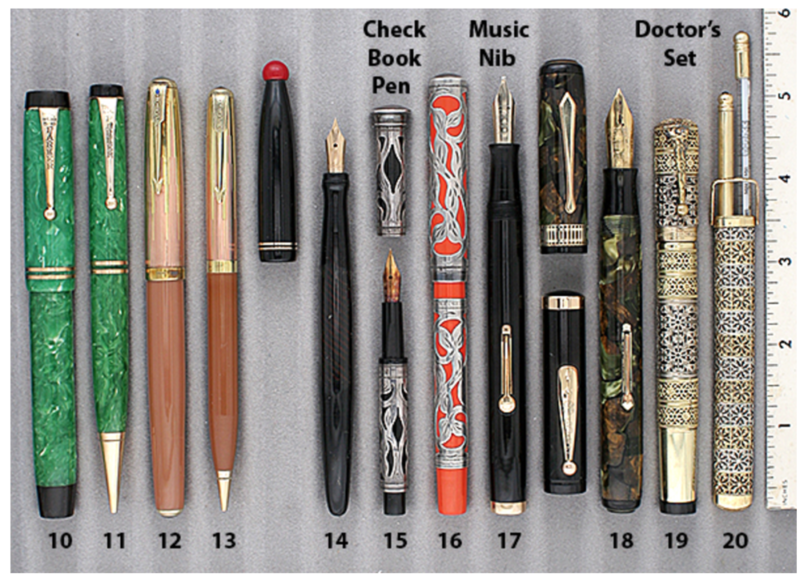 Waterman was late to the gate when it came to switching from rubber to plastic pens. They had invested a lot of time and money to develop colored ripple pens (olive, rose, blue-green) and wanted to recoup investment by producing in those materials. Eventually, they saw the handwriting on the wall and switched to plastic, introducing the now iconic Patrician. GFT. This model has Waterman’s “Tip-Fill” feature, allowing the pen to be filled with only the tip of the nib in ink, eliminating the need to wipe off the gripping section after filling. Medium, extra-flexible nib with an italic flair. Item #18 in Catalog #82.